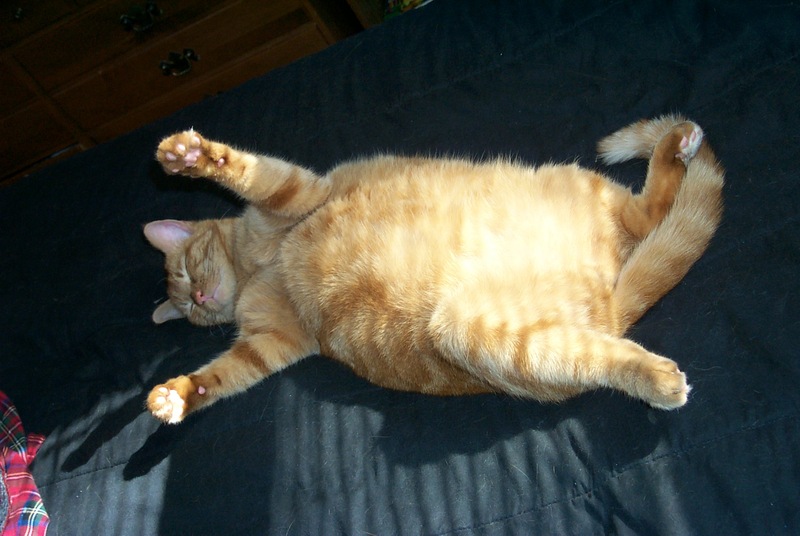 Overweight animals are 99% of the time their humans fault. Let’s take a moment and examine why…Feeding human food to our pets. We’re all guilty of it, a little chicken here, some potato chips there, a bit of scrambled egg in the morning. What starts out as a harmless action can quickly turn into one of the most detrimental things we ever do to our animals. I know, sounds crazy, but feeding table scraps to our pets is one of the absolute worst habits to pick up. Human food has a different caloric content than pet food. Whether you feed raw, kibble, or canned food, the actual calorie count is quite different between species. It doesn’t stop there either. Ever wonder why so many dogs are just waiting to get into the cat food? Well the calorie content is much different, and often times these foods have a much higher fat content. While our pooches foods should focus on protein, our cats have different digestive requirements. Take that a step further and think about what a bunny might eat, much more foliage and of course lots of carrots! Each creature has different biological requirements, however one thing is certain, human food is not on that list. Firstly, humans tend to eat much less healthy than our animal counterparts. Where a horse may go binge on some sweet green grass or delicious oats, humans often don’t think twice about delving into a colossal bag of potato chips or a king size Kit-Kat. A 21-ounce steak or three burgers is a standard American meal. What a human should be eating, however, is quite different. Perhaps cutting that steak down to 4-6 ounces with a side salad and some asparagus would be the healthier choice. To put things into perspective, our 45-pound dog eats 12 ounces of his food daily. If he were to eat like the average American, he’d be consuming almost four times that amount. With numbers like that no one would be able to afford to feed his or her pets! Each time we choose to slide our pet a few table scraps, we are adding unnecessary calories to their daily intake. Rarely, if ever, is this just a once in a blue moon sort of thing. More often than not those that give people food, continuously do so. One or two pretzels to us could be a big deal to a ten-pound dog. My thoughts on all of this: If you’re going to feed them people food, at least make it healthy. A few carrots, green beans, a bit of pumpkin or apples, these are all fine and dandy. Use them as treats and teach your pet some new tricks. Sit down with some hummus and a bag of celery to share with your dog. That way, you don’t feel like the worst fur mom in the entire world when you look into your babies eyes and can just tell…he’s definitely hungry. Let me tell you something about that look, it’s all a ploy. Your pet is NOT hungry. In fact, he’s totally fine. My advice is to look away, run out of the room, hide in the restroom, anything to get away from that droopy eyed sad face that is begging you for food. If you are anything like me, you will succumb to his wishes if you do not excuse yourself quickly. Lesson learned- next dog will be taught NOT to beg…put it on the to-do list. For now, however, keep telling yourself that you’re doing them a favor by not feeding them something that wasn’t meant for them. And perhaps, if it’s not something you should be giving your dog, maybe it’s something you shouldn’t be having either? My rule of thumb is simple, if someone gives my dog people food, I need to know about it, so I can either exercise him more or cut an ounce or two out of his dinner. Keeping that in mind has made feeding time a whole lot easier. Why are we so strict in my house? For one, an overweight animal is an unhealthy animal. Obesity is not a joke and there are several conditions that are secondary to this. All can be linked either directly or indirectly to weight issues. Very rarely will you find a healthy weighted animal to be sick with any of the above listed conditions. Do yourself and your pet a favor, put the treats and table scraps away. There’s always space in the fridge for leftovers for YOU to enjoy, and maybe some carrots that Fido can munch on too.